This is Justin Brown’s search to find ‘the real New Zealand’ – the place where number 8 fencing wire fixes everything and sheep run amok. He puts some of our most popular myths through a 21st-century reality check with more than a dash of humour. ‘Comical, thought provoking look at our country’ — Nicky Pellegrino, Herald On Sunday. ‘Justin Brown is the natural heir to Max Cryer, except he’s shorter and can’t play the piano’. — Radio New Zealand broadcaster Jim Mora. 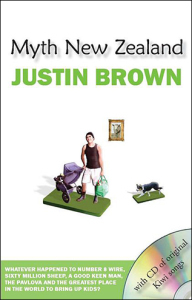 ‘A humorous and provocative look at New Zealand and the way we see ourselves today’ — book critic Graham Beattie.